﻿A new public art sculpture created by Harvard Forest Fellow David Buckley Borden and Harvard Forest Senior Ecologist Dr. Aaron Ellison in partnership with Harvard's Office of Sustainability, and Common Space will be on view at the Harvard University Science Center Plaza from Oct. 19 to Dec. 7, 2018. This educational installation combines science-communication, art, and environmental design to communicate local and global climate change data. 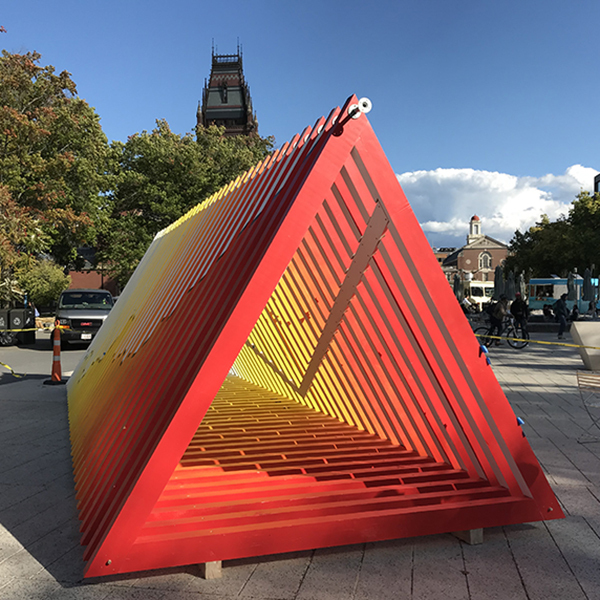 The design represents climate change as a series of painted triangles ("deltas") constructed from ten foot long 4x6" hemlock timbers that were harvested and milled at the Harvard Forest. Shadows, moiré patterns, and heat-gradient color-spectrum vibrancy change as the 10.5 x 12 x 28’ work reflects the sun's arc, producing a work that will reward repeated visits. When viewed from the side, the timbers reveal a wall of information about climate change: one side highlights the dramatic rise in global average temperatures since 1880. The other highlights potential warming futures. The sculpture leaves space at the end of the time series for more triangles to be added. Visitors will, in effect, become a part of the story of Earth's climate history and be encouraged to consider their vital role in its future. The exhibit's opening event, called "Climate is Global, Change is Local," will be held Oct. 22, 4-5:30pm in Harvard's Cabot Science Library. The event is open to all, but particularly geared towards students. It is co-hosted by Harvard Forest and the Office for Sustainability and will include presentation by the artists, plus speakers from across Harvard's schools and centers (including the Graduate School of Education, Graduate School of Design, and Harvard College Conservation Society), who will describe their local work on climate and some pathways for students to get involved.